Get creative with your houseplant displays this winter and try hanging a few plants in the window to create a string garden. 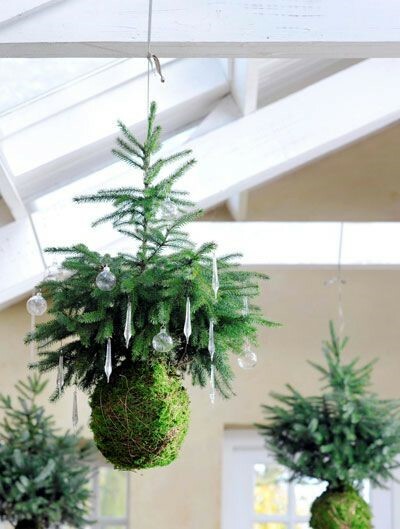 The term String Gardening is a term that has become attached to a style of Japanese bonsai known as kokedama, which literally means "moss ball" in English. Instead of growing plants in a traditional container, the root ball is replaced with a special soil and wrapped in moss and string. These living planters can make a distinctive display piece in your home as they can be hung, fixed to a piece of driftwood or bark, or nestled into a container or tray. 1. Moisten the moss if it is the dried variety by soaking in a bucket of water for an hour. Squeeze it out and lay aside until the last step. 2. 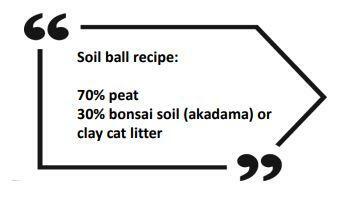 Mix together your soil mixture composed of 70% peat moss or potting mix and 30% bonsai soil (akadama) or clay cat litter. Add water gradually to your mixture until the medium can be gathered into a ball. Press it firmly all around to adhere the soil mixture into a ball. 3. Remove your selected plant from its container, dust off the excess soil and gently break apart the root ball. 4. Make a hole in the clay ball big enough to push in the roots of the plant. Push the clay around the roots and compact it around the base of the stem. the moss onto the ball with at least two passes around the surface. area or place in a container. Watering is your main maintenance task with a kokedama and you can use your finger to check the moisture level of the ball and or check the weight. If the ball feels light, it's likely time to water. If watering is needed: Fill a bowl, bucket or sink with room temperature water. Place your kokedama in the water, plant side up. Push the moss ball down so that it is fully submerged and begins to absorb water. Allow to soak for 10-25 minutes, or until bubbles stop coming up. Remove the kokedama from the water, and gently squeeze the moss ball to allow excess water to drain. Allow to drip dry in a colander before replacing it to its given home.